First stop was the Minto crag area – a well known volcanic ring dyke right in Boonah’s backyard. It’s difficult to grasp it from the ground but a quick look on Google Earth will show you the obvious ring formation. This photo was taken from the eastern side at sunrise. It’s a 6 image panorama. From a little further down the road, I would have loved to get closer to the water but I don’t know the landowner. While I was out taking photos I also had my Sony action camera taking a timelapse sequence – 1 photo every 5 seconds over and hour or so. Then I continued up the range, stopping to have a quick look at Teviot falls which was running really nicely after the recent rains. 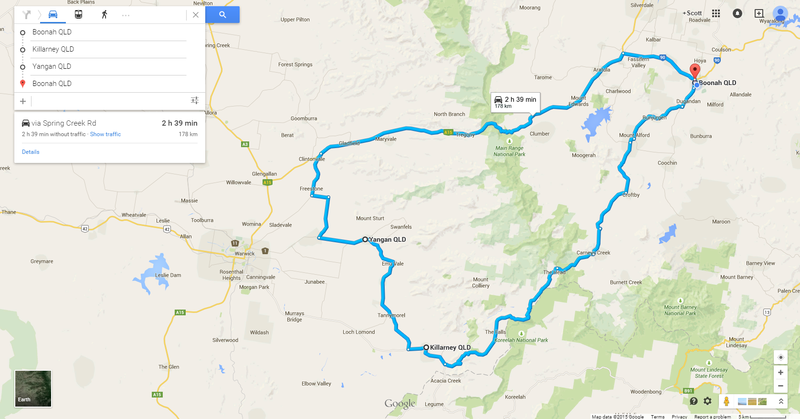 T hen up towards the Condamine valley, up through Spring creek and a quick pause at Dagg’s falls. As far as I know there isn’t a way down there but this view is about 5meters from the carpark. Ah, so this is in Australia?? (Even with the map, I couldn’t figure out a country or state). Great photos! Hi Frank, yes in South East Queensland, Australia. About an hour from Brisbane.